It is no coincidence that Naxos is amongst the most preferred summer destinations in Greece. With its authenticity, friendly atmosphere and simplicity, it has won a distinct place among the Cycladic islands. Being the biggest and greenest island in the complex, Naxos is full of diversity and literally has it all: world famous beaches, impressive cultural monuments, rich folk tradition, great natural variety including mountainous landscapes as well as seaside villages, agricultural activities, authentic local cuisine and vivid night life. It is also an island of interesting mythology. It is said it is the place where Zeus, the father of the 12 ancient Greek Gods, was raised and Dionysus, the God of wine and festivity, was born. 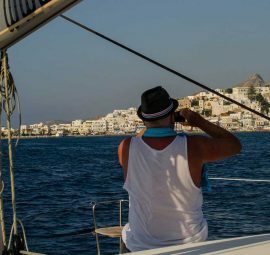 No matter how many days you spend in Naxos, there will be always something new to discover and a warmhearted local who will get out of his way to make sure you get the genuine Greek experience the island has to offer. Portara: is the emblem and main landmark of Naxos. It is a single massive marble door with no walls attached to it, standing on the islet of Palatia at the entrance of the port. The monument is the remains of an unfinished ancient temple dedicated to Apollo, the God of music, songs and poetry. Portara was constructed in the 6th century BC by the orders of the ruler Lygdamis. He wanted to build the highest and most prominent building in all of Greece. The temple was supposed to be 59m long and 28m wide, but it was never finished due to a war that started between Samos and Naxos. When the war finished Lygdamis was thrown out of power, and his vision was never completed. A visit in Portara is highly recommended, especially at sunset time. The islet of Palatia is connected with Naxos via a pathway and offers wonderful panoramic views to its visitors. Kastro (Castle): is on the top of Chora and is the most picturesque part of Naxos town. Kastro was built by the Venetian conqueror, Marcos Sanoudos in the 13th century. This medieval fortified settlement used to be his palace. The nobles used to live here completely separated from the lower class. Kastelopoliteia today is one of the most well preserved settlements of its kind in Greece and is still inhabited. Inside you will find a beautiful intermix of Venetian and Cycladic elements, such as narrow paved alleys, villas and house towers. A walk in its alleys will take you back in time. There you will have the chance to admire the Capella Karatza, the Ursuline School, the Crispi Tower that operates as a Byzantine Museum, the Sanoudo Tower, the Catholic Episcopal Palace and the Catholic Cathedral. Bazeos Tower: a famous monument of Naxos near the villages of Halki and Filoti. It was built on the 17th century to protect the residents of the area from pirate attacks. Cave of Zas: a cave situated on the western side of mountain Zas. The cave is 115m high and 75m wide and has impressive stalactites and stalagmites. According to mythology here is where God Dionysus, son of Zeus, was brought up. Chimaros Tower: an important monument of Naxos. This impressive defensive tower of 15m height is located near Filoti village. 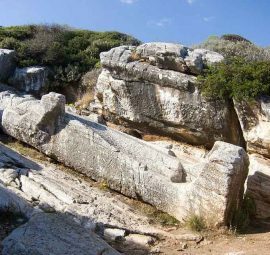 Kouros of Apollonas Statue: a huge statue located in the village of Apollonas. This impressive statue is 10m high and was constructed in the 8th century BC. There is uncertainty on the God it depicts. Archeologists are torn between God Apollo and God Dionysus. Melanes Kouros Statue: a big statue of the 7th century BC. This impressive 6m long statue of a young man (kouros) can be seen on the village of Melanes. Mycenaean Tomb: an ancient tomb dating back to the 13th century. It is unclear for whom it was built for. Archeologists suggest that it might be the grave of Naxos, the first king of the island after whom it was named. Temple of Demetra: the ancient temple of Demetra, the Goddess of grain, is situated near the village of Sagri. 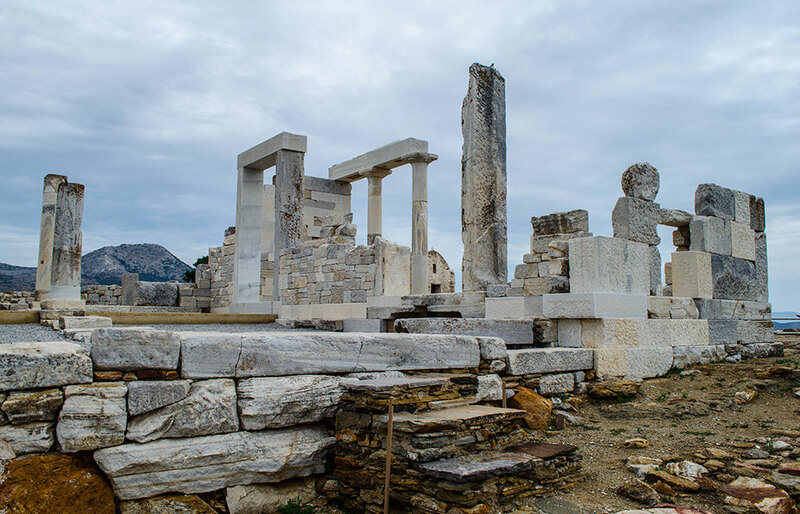 It was constructed on the 6th century BC out of the finest quality of Naxos marble. Temple of Dionysus: the ancient temple dedicated to God Dionysus was constructed on the 6th century BC near Glinado village. After several reconstructions in the centuries that followed, the temple finally turned into a Christian church. Vallindras Distillery of Citron: is the first distillery in Naxos, established in 1896. 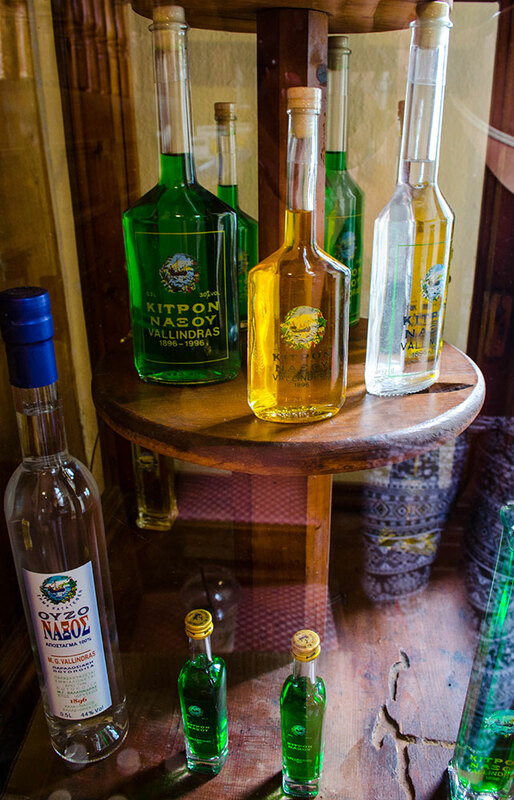 It is located in Halki village and used to produce the famous local citron liquor, similar to lemon. Today it works as a museum as well as shop. Naxos has many traditional villages to charm its visitors. Whether you are close to the beach or further inland there is always a small settlement nearby to discover and explore. In contrast with the rest of the Cyclades, Naxos is blessed with impressive mountains and fertile green valleys. Here you will find unique settlements built on the slopes of mountains, nestled in olive groves or sun-kissed by the sea. Nikos Kazantzakis, one of Greece’s most notable writers, wrote about Naxos beauty: “if paradise was on Earth, it would be here”. Naxos capital town called Chora is considered one of the most distinctive in the Cyclades complex, because it has managed to preserve the historic elements of its rich past and harmonically combine them with its unique folklore culture. Chora holds an impressive intermixture of Venetic & Cycladic architecture, full of narrow alleys, whitewashed houses & old mansions and a strong local color. This large town is spread behind Naxos main port, on the west side of the island. The port area is the center of Naxos’ tourist activity with many restaurants, shops, bars and clubs lining on the waterfront. Portara, the trademark of Naxos, is situated on the northern part of Naxos. 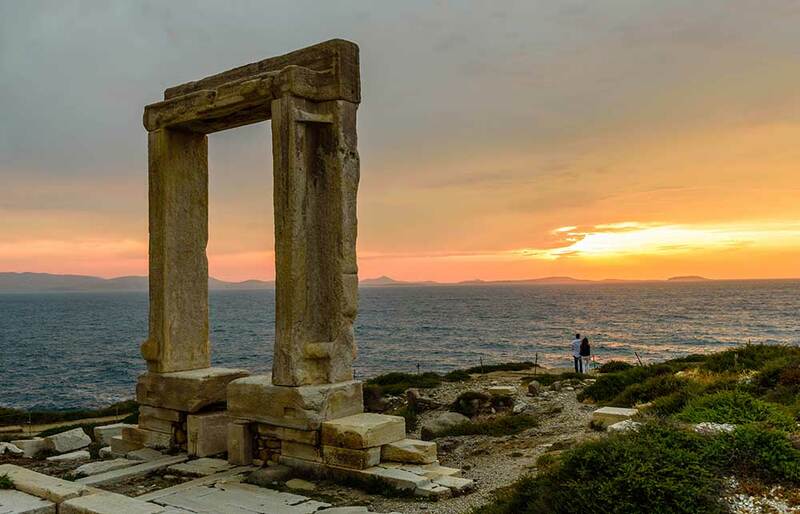 The huge marble gate of the ancient Temple of Apollo stands alone on the small islet of Palatia, without any walls and offers its visitors stunning sunset views over the Aegean Sea. On top of the capital there is an impressive medieval castle, the palace of Marcos Sanoudo, who conquered the Cyclades in 1207. The castle is well preserved and inhabited until today. 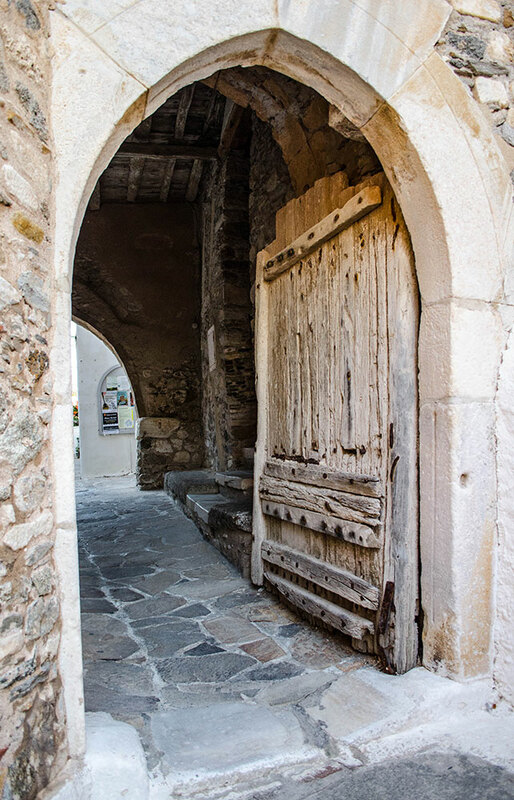 Roaming through its atmospheric medieval alleys will travel you back in time. In the castle area you will find beautiful mansions, monuments and churches, as well as the Archeological Museum of Naxos and the old Jesuit Commercial School. The modern settlement of Chora spreads around Protodikiou Square with plenty tourist amenities that offer anything you need, but it might take you a while to learn how to navigate in its slightly confusing urban planning. The beautiful Chora of Naxos is always full of life and a meeting point for most visitors. 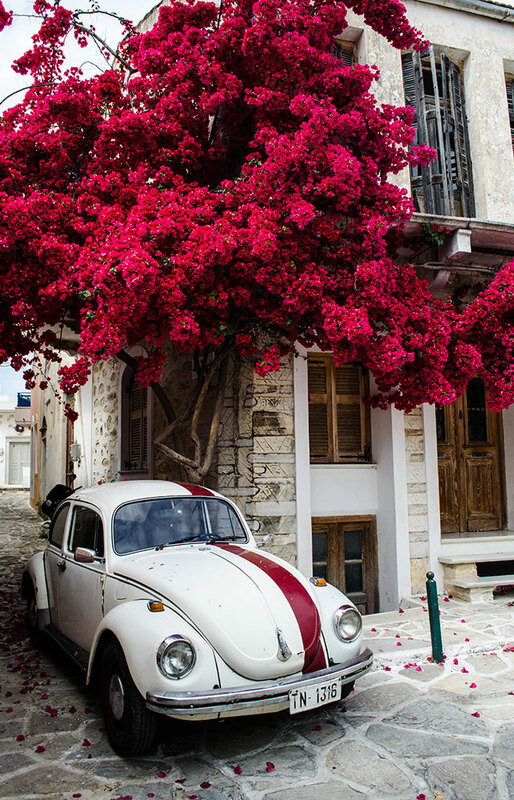 Apiranthos is considered one of the most beautiful mountain villages of Naxos, with fairytale alleys, picturesque cafes and distinctive tradition. It is located 28 km from Chora at an altitude of 600m and is composed out of fine marble-strewn alleyways and wonderful marble houses with clear Venetian influence. On the entrance of the village there is an impressive Venetian Tower dating back to the 17th century. Other popular attractions include the Archaeological Museum of Apiranthos, the Folklore Museum, the Geological Museum, the Natural History Museum, the Aegean Children’s Art Museum, the church of Panagia Aperanthitissa, one of the oldest churches of Naxos, and the church of Agia Kyriaki, one of the most important Byzantine monuments of Naxos. 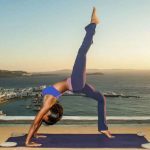 Chalki is situated 16km from Chora, in the region of Tragea, a verdant valley filled with olive grove, oak trees and vines. Thanks to its position at the center of the island’s road network, this lovely Venetian style village used to be the capital of Naxos. It is composed out of many neoclassical houses and handsome villas, impressive Byzantine churches and well preserved Venetian towers. In the area you will also find the Church of Panagia Protothroni, the imposing 17th century Barozzi Tower, the historic Vallindras distillery of the renowned citron liqueur. A stop for a walk in the charming alleys of Chalki and a taste of its local products is highly recommended. Filoti is the largest village of Naxos, located 19 km from Chora, on the foot of mountain Zas. The village is built in a steep hill and offers beautiful green and mountainside views. 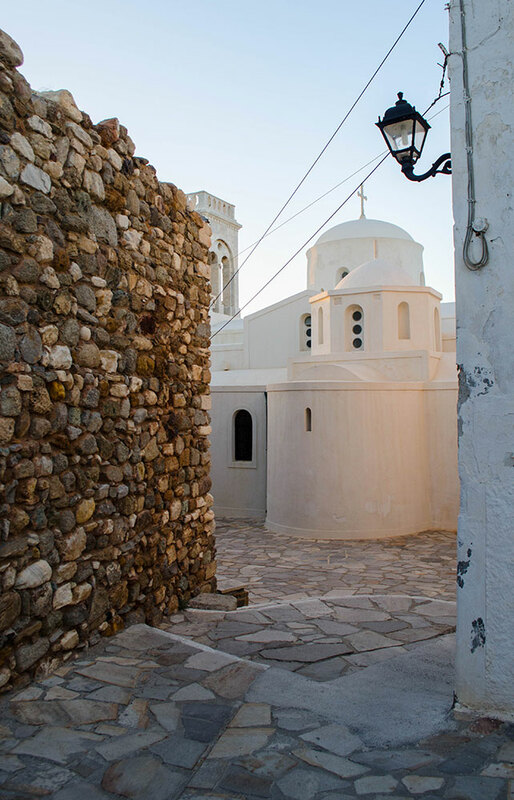 It is a traditional Cycladic village with whitewashed houses and narrow alleys. In its beautiful paved square you will find many restaurant, cafes and shops. Filoti’s sights include the Filoti Association Cultural Center, the Panagia Filotitissa church, the Barozzi Tower and the Greek Numismatic Collection Museum of Nikolas Moustakis. 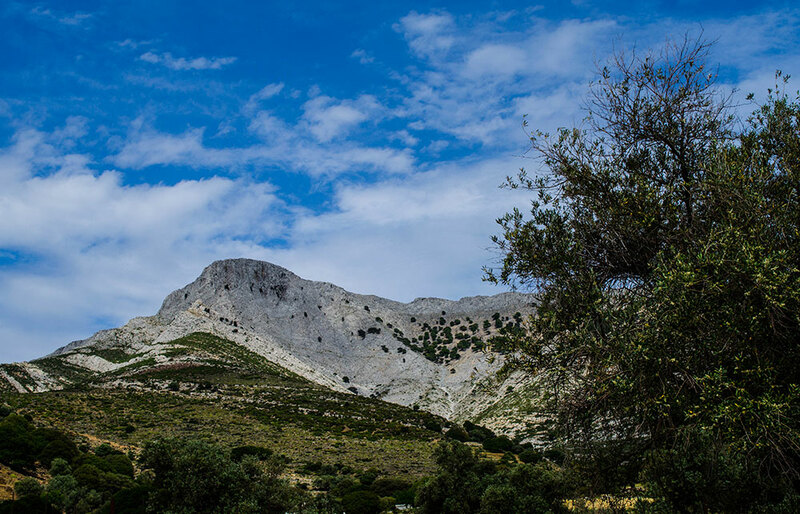 You can also combine your visit to Filoti with a hike to mountain Zas and its famous cave, located on the mountain’s slope. While in Filoti don’t forget to try some of its excellent quality local products. The village is well known for its livestock products, cheeses and local sweets. Sangri is one of the most charming villages of Naxos, located on the west side of the island. The village stands out for its medieval architecture and picturesque alleys. It is comprised of two distinct settlements, Ano Sangri and Kato Sagri. Kato Sagri is a listed protected settlement known for its superb architecture. In the settlements you will find the Monastery of Agios Eleftherios, a tower-like Folklore museum and the remains of two Venetian towers. Right outside Sangri there is the ancient temple of Demetra, the Goddess of corn, grain, and the harvest. This temple is one of the most important archeological monuments in Naxos. Agia Anna: is a continuation of the famous Agios Prokopios beach and it is also very popular and a major attraction in the island. The beach is comprised of several sandy bays that are interrupted by a small fishing port full of picturesque caiques. In its long golden sand and turquoise waters you will find lots of visitors every summer. 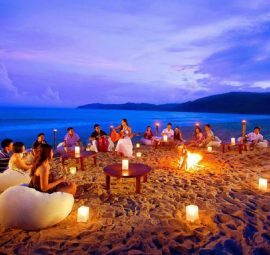 Right on the beach there are all sort of tourist facilities such as, sun beds, umbrellas, fish taverns, beach bars and restaurants. Very close to the beach there are also many rooms to let and various hotels. Access is very easy. It can be reached by car, bus or foot from Agios Prokopios. Agios Georgios: is a long sandy beach that extends for many kilometers. It is very popular due to its proximity from the port and Chora. 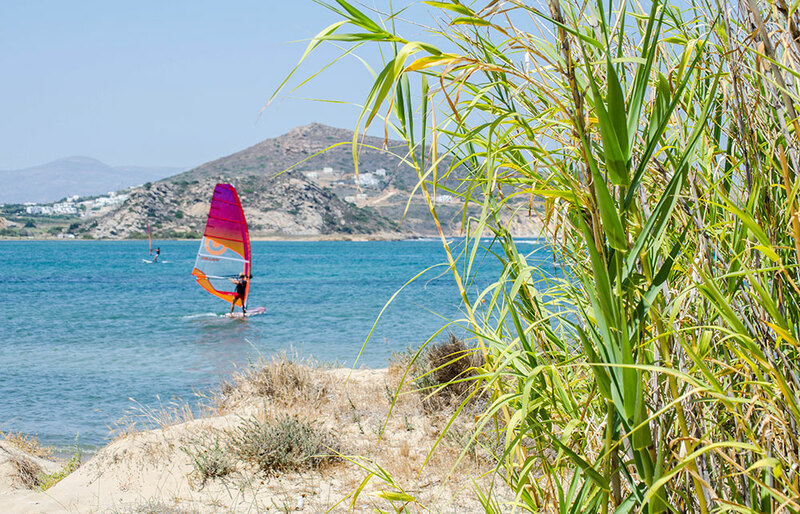 Agios Georgios is also one of the favorite spots of windsurfers and kite surfers, as it has a lot of waves. 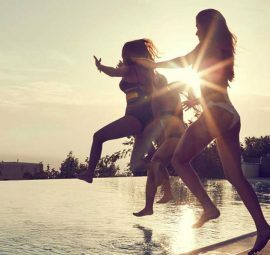 It is fully organized with numerous amenities, such as sun beds, umbrellas, water sport centers and beach bars. In the surrounding area there are also numerous accommodations. The beach can be reached by foot from Chora. Agios Prokopios: is the most renowned beach in Naxos and a major attraction in the island. It constantly ranks as one of the most beautiful beaches in the Mediterranean, due to its lengthy golden sand and stunning blue green waters. The beach is partially organized with sun beds umbrellas and water sports facilities. The other part is left to its natural beauty without any tourist facilities. Behind the beach lies the settlement of Agios Prokopios with all short of tourist amenities, such as cafes, bars, night clubs, accommodations, restaurants, taverns and many shops. The beach can be reached by car and bus. Alyko – Small Alyko – Kerdos - Hawaii: are small bays located just below a unique cedar forest at Alyko peninsula that has been declared as a protected natural area. These secluded sandy beaches with turquoise waters are serene, exotic and ideal for those looking for tranquility. Kastraki: is the extension of Mikri Vigla beach and is a beautiful white sandy beach with crystal and tranquil waters that attracts a lot of visitors. There are a few amenities available, including sun beds, umbrellas, restaurants and accommodation units. 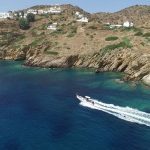 Mikri Vigla: rates as one of the most beautiful beaches in Naxos. This gorgeous small beach with white sand and turquoise waters is separated by a hill into two parts. Its north side is also known as “Limanaki” and its south side as “Sahara”. Limanaki is exposed to the northern winds and is an ideal spot for windsurfing and kite surfing. Sahara is more protected from the winds and thus preferred from families and those looking for tranquility. 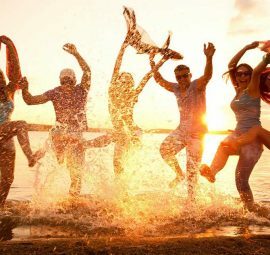 The beach is well organized with all sorts of amenities including sun beds, umbrellas, water sport centers, restaurants, taverns and cafes. 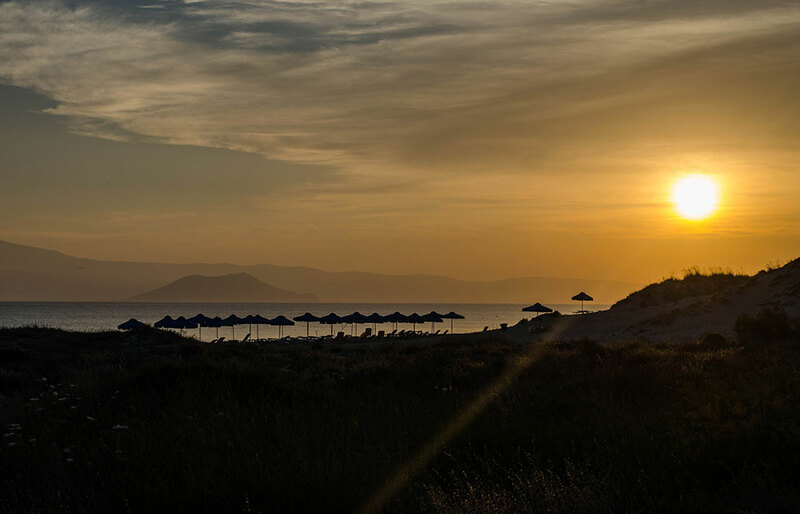 Mikri Vigla is also one of the most popular sunset spots in Naxos. 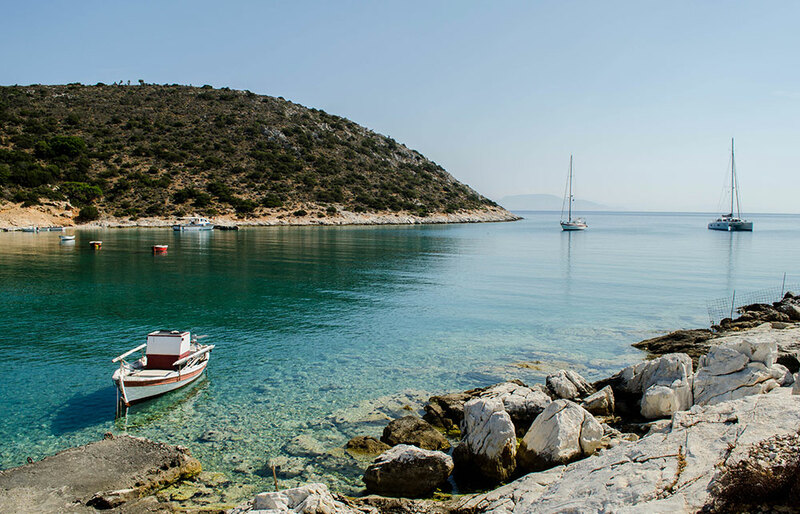 Moutsouna: is a natural fishing port on the east side of Naxos separated into two beaches, Ai Giannis and Tigani. Both beaches have fine sand, crystal clear shallow waters ideal for families. In the area you will find fish taverns and small accommodation units that provide anything you may need. Panermos: is a small oasis at the end of the southeastern coast and one of the most beautiful beaches on the island. This small bay has white sand and pebbles and calm crystal green waters fully protected from the wind. On the coast there are a few palm trees for natural shade that give the beach the lush looks of the tropics. Panermos’ idyllic scenery is offered for isolation and tranquility. The beach is semi organized with only a small snack bar at the back of the beach. From Panermos you can visit Rina’s cave, where many wild birds nest, and to some of the secluded southeastern coves of Naxos only accessible by the sea. 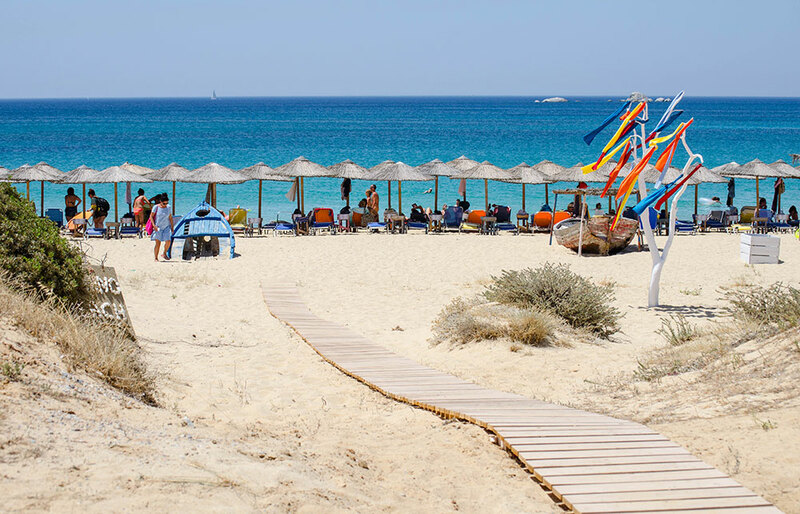 Panermos beach is 12km from Matsouna village and 54km from Naxos Chora, so be prepared for a long drive if you are staying on the west side. It is however, totally worth it! Plaka: is an endless sandy beach right next to Agia Anna with striking turquoise waters. It was the favorite spot of the hippies in the 70’s and remains one of the most popular and attractive spots in the island until today. 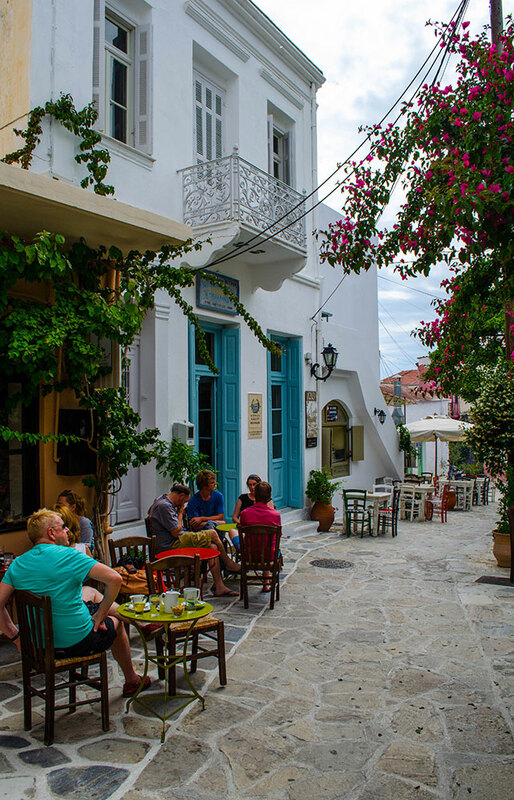 Plaka stretches for many kilometers and is ideal for relaxation and quietness. 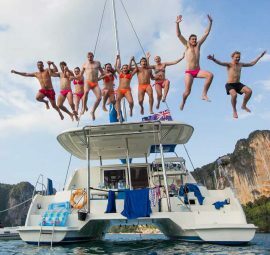 There are several spots with tourist facilities, such as sun beds, umbrellas, water sport centers and beach bars; however most of it keeps its unspoiled natural beauty without any amenities. The northern part of the beach is usually preferred by nudists. Right behind the beach you will find many traditional taverns, restaurants, cafes and hotels. The beach can be reached by car or on foot from Agia Anna. Psili Ammos: is sandy beach on the eastern side of Naxos, close to Moutsouna. This wide beach with fine sand and crystal clear waters spreads before a tree forest and has a touch of tropical landscape. Psili Ammos is intact from tourist development and is perfect for tranquility and relaxation. 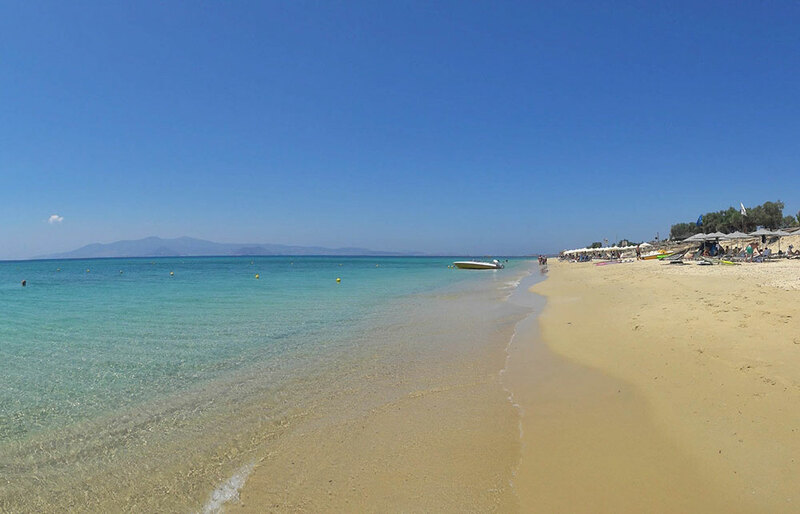 Pyrgaki: is a wide sandy beach on the southwestern part of Naxos with turquoise waters. It is ideal for those looking for tranquility as it is never crowded. It is also a quiet spot for water sports fans and windsurfers, as it is frequently affected by the winds. It is an organized beach with numerous amenities including sun beds umbrellas and taverns. According to mythology, Zeus the King of Gods grew up in Naxos in order to hide from the rage of his father Cronus. Zeus’s son Dionysus, the God of merriment and wine, was also raised in Naxos in the cave of Mount Zas (named after Zeus) in Filoti. In fact, he loved Naxos so much that he made it a fertile land with many vineyards that produced excellent wine. In return, Naxiots built a temple to honor the God at Yria. 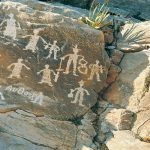 Ancient times: Naxos has been inhabited since the 4th millennium BC. 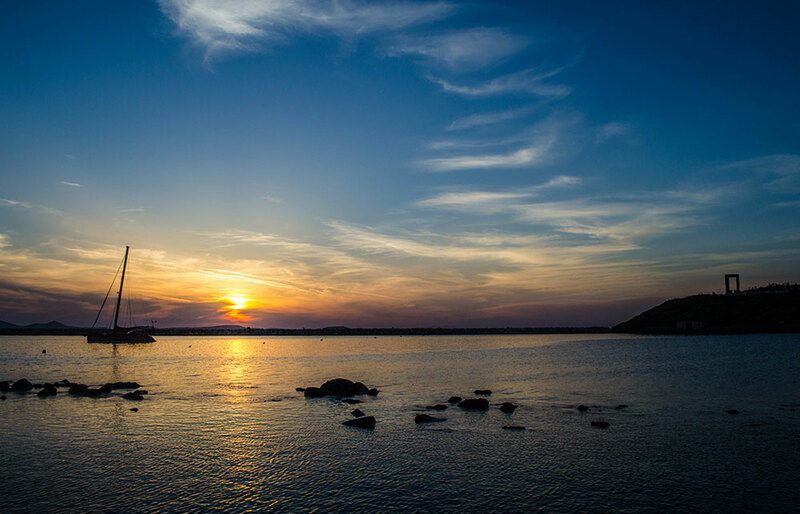 Thracians were the first to dominate the island and it is believed that the island was named after the Thracian leader Naxos. Then the island was dominated by the Carians, but Naxos’s first important period of development was the Cycladic period, in the 3rd millennium BC. The most developed settlement, with meticulously built houses, cemeteries and pottery items has been discovered at Grotta, where Chora is today. Findings indicate that Naxos was one of the most important centers in that period. Earlier Times: During the 7th century BC Naxos was ruled by the Ionians. The island enjoyed substantial wealth from sea trading and developed remarkably in arts. In 490BC Naxiots were attacked by the Persians and their city was destroyed. However, in the naval battle of Salamis, Naxiots revolt against the Persians and joined Athenians. In the Peloponnesian war that followed Spartans won the Athenians and took Naxos under their control. After that, Naxos felt under various tribes until it was taken over by the Romans. Byzantine & Venetian Times: During the Byzantine Empire Naxos enjoyed great prosperity. Christianity was introduced on the island in the 1st century AD. The abundance of churches and monasteries from that period signify that island’s substantial economic growth. After the gradual decline of the Byzantine Empire, Naxos fell under the rule of the Venetian Marcos Sanoudos. The conqueror took over the Cyclades and formed the “Duchy of the Aegean”. Naxos was used as the headquarters and the powerful castle on the top of Chora was built. Later Times: In 1564, Naxos suffered the same fate as the rest of Greece by falling under rule of Turks. However, the Turks never settled on the island. The Venetian negotiated their authority on the island and agreed to keep their administration in retain for taxes. Naxos became part of the Greek state, after the great revolution of the 1821 where the whole country was liberated. Cheeses: Naxos is famous all over Greece for its unique and excellent cheeses. A few of the cheeses you must try when in Naxos are: graver of Naxos (hard cheese with peppery & savory taste), arsenic (hard white cheese), ladotiri (cheese that has been in a container with olive oil for more than 3 months), sweet mizithra (low fat, unsalted), ksinomizithra (sour mizithra) and anthotiro (low fat, slightly salted). Citron Liquer: is a special aperitif made out of citron leaves. Its taste resembles a strong lemon liquer. Wine: Naxos is full of vineyards that produce excellent wine. According to mythology, God Dionysus, the God of wine, grew up here, and blessed the land with fertile soil and exceptional vineyards. Naxian wine is served in every tavern and restaurant of the island. Panagia Argokoiliotissa: On Holy Friday one of the most important feasts of Naxos, Panagia Argokoiliotiss, is being held at Koronos village. 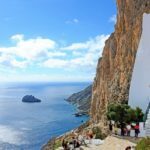 Agios Thalalaios: On May 20th Aghios Thalalaios is celebrated at Thalalaios village with traditional dishes and live music. Ai Giannis Klidonas: On June 24thone of the biggest summer celebrations of Naxos takes place. The night before the celebrations (June 23th) Naxian men gather at squares and jump over fires to expel all evil, while the unmarried girls of Naxos engage in special customs in order to see their future husband in their dreams. Agioi Apostoloi: A multi-day celebration from June 29th to July 1stat Melanes village. Agios Nikodemos Agioreitis: On July 14th a great feast is held to celebrate Agios Nikodemos, the protector of Naxos. Celebrations include local delicacies, traditional music and fireworks. Assumption of the Virgin Mary: On August 15ththroughout the island. This is the greatest religious celebration in the island. Cookery Contest (Kouzinomagiremata): Every July, a cookery contest of traditional cuisine takes place in Danakos village. At the end of the contest there is a big feast with live music. Demetria: A cultural event of Naxos held every year during the first week of August at Sagri. Visitors have the opportunity to try many Naxian products and watch a number of cultural events including theatrical plays, concerts and exhibitions. Domus Festival: A musical event held by the Venetian Museum of Naxos in Kastro, between April and October. Elaia Festival: One of the bigger cultural events of Naxos dedicated to the arts. The event is held at Kaloxylos in August and features sculpture, photography, live music, theater and dance performances. Fisherman’s Festival: On June 28th, the annual Fisherman’s Feast takes place in Apollonas village with live music and lots of seafood and fresh fish. Naxathlon Triathlon: Every August, athletes from Greece and abroad take part in Naxos’s competitive Olympic distance triathlon. Naxos Carnival: Every March, Naxos transforms into an interactive stage hosting a multitude of events for Carnival that highlight the island’s unique cultural and culinary flavors. Naxos Festival: One of the most popular summer festivals of Naxos held between July and September at the Tower of Bazeos. Events include art exhibitions, concerts, theater and dance. Olive Oil Extraction Festival: Every year, the village of Damalas holds a feast where visitors can observe the olive oil extraction process and enjoy local culinary delights and traditional music. Usually the festival takes place in late January or early February. Potato Festival: Every August, the popular Potato Festival takes place in Agia Anna. Visitors have the opportunity to taste traditional potato-based dishes, made with locally produced potatoes, famous throughout Greece for their great taste and quality. Rakinzo Feast: Every October or early November, the distilment process of raki takes place in Naxos. Visitors have the opportunity to taste raki and traditional delicacies.